Melnick spent 20 years in the United States Coast Guard, rising to the rank of Commander. His assignments included serving as operations officer and chief test pilot at the Coast Guard Aircraft Program Office in Grand Prairie, Texas. In that capacity, he conducted most of the developmental and all of the acceptance test flights for the HH-65 Dolphin helicopter, including sea trials, and wrote the HH-65 flight manual. During his Coast Guard service, Melnick received numerous awards, including two Department of Defense Distinguished Service Medals, two Distinguished Flying Crosses and the Secretary of Transportation Heroism Award. In 1992, he received the U.S. Coast Guard Academy Distinguished Alumni Award. He logged over 5,000 hours flying time, predominantly in the HH-3F Pelican, HH-52 Sea Guard, HH-65 Dolphin, and T-38 Talon aircraft. 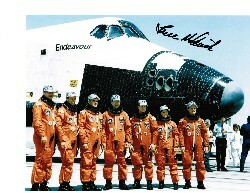 Melnick was selected 1987 by NASA and became in August 1988 astronaut with the missions STS-41 and STS-49. He was the first Coast Guard aviator to participate in the space program, and was the first Coast Guard aviator into space.